L1 launch windows were determined by the phase of the moon. The earth sensor could only operate when either the earth or moon's disk was at least 40% illuminated. This constrained launches to two brief periods each month. The simple constraint on L1 launch dates. There has been some discussion on the constraints for launch windows of the Soviet L1 manned circumlunar spacecraft (note for example the articles by Grahn, and the discussion in the article of Vick and Pesavento cited in the bibliography). However examination of the Kamanin diaries yields some overlooked information: discussion of launch window dates when no launch occurred, and discussion of primary and fallback modes of navigation for the L1 manned circumlunar spacecraft. This indicates the primary constraint was adequate illumination of the disk of the earth to allow the spacecraft's orientation system to function. 100K star sensor, which was designed to detect Sirius. The sensitivity of this sensor was adjusted by commanding one of three filters into place. 106K solar sensor, which determine the center of the solar disk. This also served to orient the spacecraft's solar panels toward the sun during the translunar coast (when the spacecraft was put into a yaw of 1 deg/sec to maintain solar orientation). The procedure was for the spacecraft to orient itself to the sun using the 106K sensor (defining the 'y' axis in the LOK drawing below). Then the spacecraft would then pitch around the 'y' axis until the 107K sensor acquired the earth. This defined the x axis. The spacecraft would now yaw until the disk of the earth was centered, and this would define the z axis. The spacecraft was now oriented with a precision of a degree or so. A more refined orientation was obtained by further orienting the spacecraft in the predicted plane of a guide star until the star sensor acquired its target. For midcourse maneuvers or re-entry, the gyro platform would be spun up, and the spacecraft oriented using the gyroscopes for the desired thrust vector. Each mission had eight orientation sessions (four outbound and four inbound). At these sessions the spacecraft's solar orientation yaw would be stopped and the spacecraft would orient itself and direct its high-gain antennae towards the earth. These corresponded to the once-per-day high rate communications sessions with the spacecraft. There were three opportunities for midcourse corrections: at 250,00 km from the earth outbound, and 320,000 and 150,000 km inbound. While the L1 had a delta-V capability of about 200 m/s, midcourse maneuvers mentioned by Kamanin were much less - between 3.3 and 15 seconds duration, e.g. between 2.0 and 9.1 m/s. It would seem likely that much less than the 400 kg of propellant capacity mentioned by Feoktistov was carried. In the event the star sensors failed to acquire their guide star (as they did more often than not on the early missions), the sun-earth orientation was good enough to make midcourse corrections (with subsequent tracking from earth to calculate the next midcourse). However the star sensor had to be functioning correctly for the final platform alignment to enable the re-entry vehicle to execute a lifting re-entry of the earth. Such a re-entry reduced the G-forces to 8-10, and allowed the spacecraft to skip out of the atmosphere over the South Pole and make a final re-entry on Soviet territory. If the star sensors were unable to provide the final alignment, the capsule would have to make a 20-G ballistic re-entry with splashdown in the Indian Ocean. (At the very end of the program, the last L1 made a re-entry over the North Pole, skipped out of the atmosphere, and made a precision splashdown in the Indian Ocean. This variant allowed Soviet tracking stations to refine the trajectory as the capsule passed over Russia. This was the variant planned for the later L3 manned lunar landing missions). From this discussion it can be seen that the vital planetary sensor had to have a visible disk of the earth to function. This meant that navigation was only possible when the moon was new (the visible face was in shadow - meaning the earth's disk would be full). So it is not surprising that the launches were timed within a window spanning only five days, opening ten days before the new moon. The guidance system for the Luna Ye-8 landers has not been described but here the launches appear randomly distributed without reference to the phase of the moon. Therefore the orientation system designed by Lavochkin for this series must have used either stellar or pure-inertial orientation. 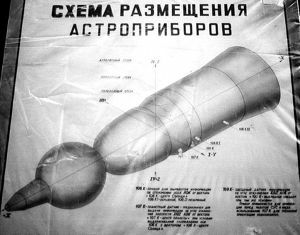 The Ye-8 return capsule did not make any midcourse corrections on the return flight, instead relying on the accuracy of its ascent engine burn to ensure impact of the capsule on Soviet territory. Two other versions of the spacecraft were launched - L1A's aboard the N1, and L1E's using the Proton booster. These two versions have very limited launch windows, but of a completely different nature - they were launched to arrive at either the first or last quarter moons. Table comparing launch windows for L1 and Ye-8 launches with lunar phases.